as a special one off challenge to take us all through into the New Year! Closing date for this one is 31st December so you have plenty of time to enter and upload your photos during those many many boring hours between Christmas and New Year LOL!! so make sure you enter your cards - max of 2 entries per person though so no cheating!! Polkadoodles HERE. Quote PD51001wk49 to claim your prizes. Thank you so much for taking the time to take part at this busy time of year. We are taking a little break over the festive season. for our first challenge of the New Year. 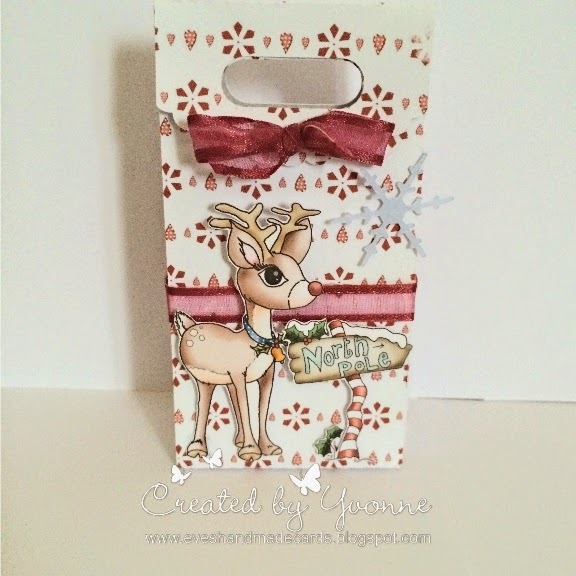 We've gone all "Secret Santa" here at Polka Doodles and this is week 2 of our challenge. We wanted to make our last challenges of 2014 a little bit different with the festive season looming. Each of the DT has made a card for someone else on the DT but nobody knows who is making for whom ... hee, hee, hee. "Who would you make a Secret Santa card for and why?" This special Secret Santa will last for 2 weeks so you have until 18th December to enter - if you're canny you could win 3 digis and we will also have 3 fabulous overall prize winners chosen at random, each of whom will receive a copy of one of our amazing Collections worth at least £10.99 each! 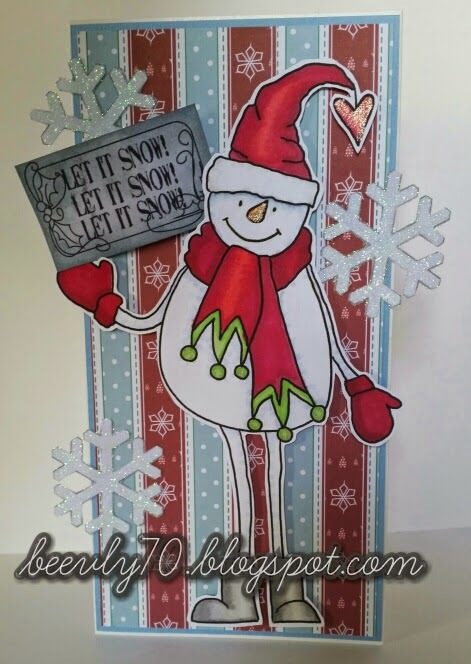 Link up to the challenge using Mr Linky below ...... now you don't necessarily have to make a card or project for this challenge but you could do a short post instead sharing your Secret Santa (crush/hero/heroine etc etc). Link up to your post as normal and use the photo of your secret crush Santa in Mr Linky. If you do make a project, link as per normal. NOW as an added bit of fun, visit each DT blog and have a guess, using the clues, as to whom they may have made their project for .... leave a comment on their blog with your idea and you could be in with the chance of winning a prize of a wonderful Polka Doodles digi image. 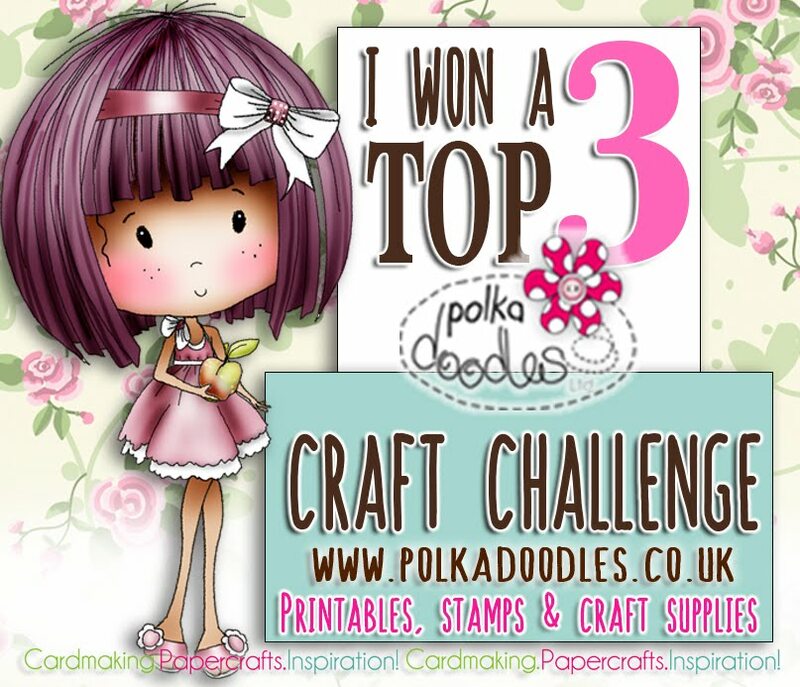 We will randomly chose 3 DT blogs (names in a hat thing) and then randomly chose a comment from each blog and the winning comment will each receive a Polka Doodles digi image. The winners of our Nordic Challenge Weeks 48 are at the end of this post! My first clue is...... my Secret Santa Teamie enjoys cycling!! Bev I've used the brilliant Poinsettia Stamp set, stamped it out a few times for the layers and coloured it with my Graph'it Markers then shaped the petals, glued the layers together with silicone and added a bit of glitter glue to the centres. 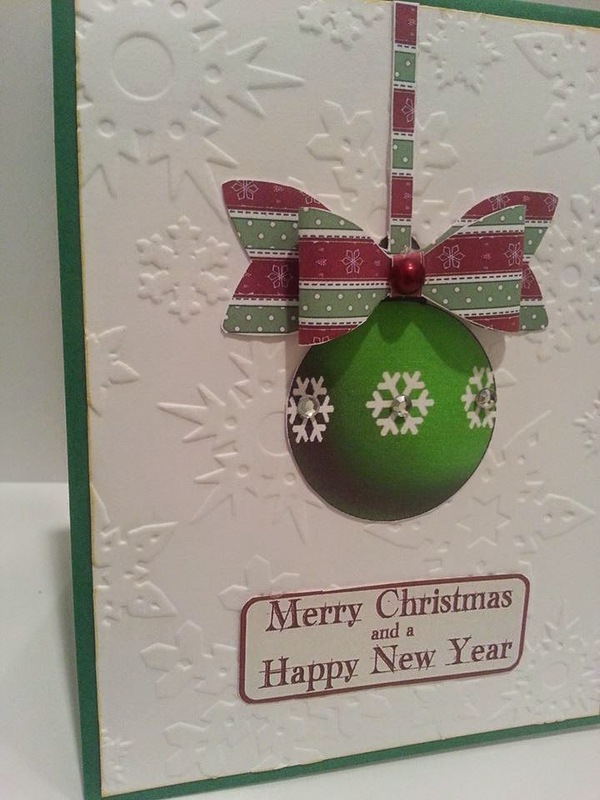 The backing paper is from Work & Play Festive Hollybobs. 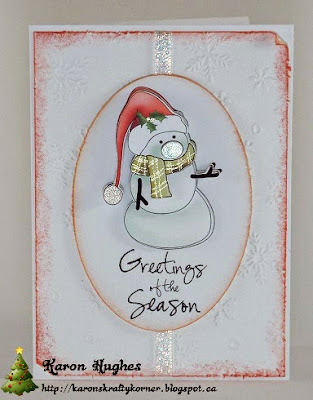 I added a scalloped, embossed, contrasting semi circle to the top of the card wrapped some festive bakers twine around it and stamped out my greeting onto a tag, inking the edges. Susan - Well isn't this exiting ! Secret Santa . I have used a digi from one of my favourite collections the amazing Rose Budd ,I just love the elegance and era of this CD.I must apologies for the Picture ,I have use pearled card stock and cant get rid of the shine . Yvonne - Hi there, well this was HARD! Making the card was nice and easy, relaxing even - the secret santa clues............................well..........!!! Like the rest of the team I used Work & Play Festive Hollibobs, which you can also get as an instant download collection. 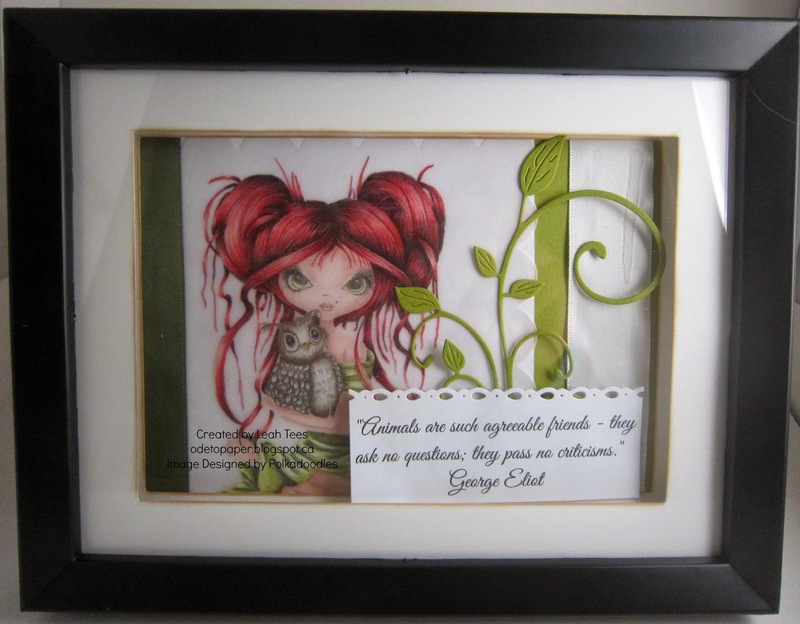 The image is coloured with my Graph'It Markers, the papers and embellies are from the collection. The first clue is.........................this lady lives by the seaside but is not originally from there. Jenny Hi there, isn't it exciting trying to guess who is getting each of the secret Santa cards, I hope you're joining in. 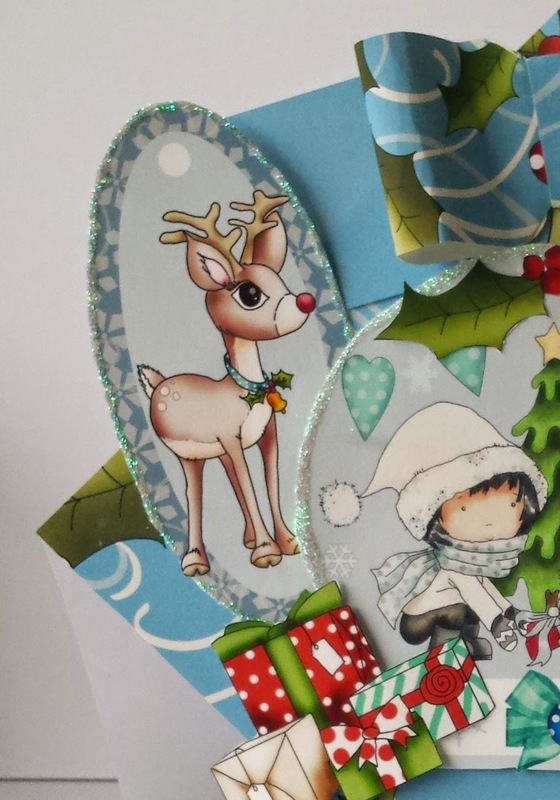 Here is a little of my card but you'll have to come over to my blog to see the rest and get all the clues. I've used the fabulous Festive Hollybobs for my card and now you can get it either on a cd or as an instant download so what are you waitng for? My first clue is this lady is very black and white! 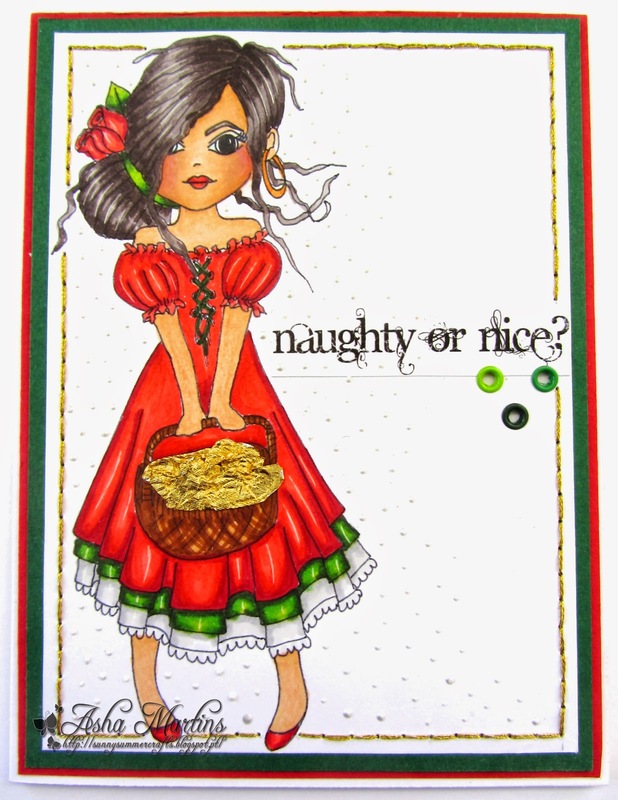 Anita here and has fun this week with the secret santa challenge hope your joining the fun... I have used this awesome digi which is available on here comes christmas cd rom .. The "Secret Santa" challenge will end on THURSDAY 18th DECEMBER at midnight (GMT) and winners will be announced on FRIDAY 19th DECEMBER. along with the challenge winner. You will get all the clues and loads more info on all the blogs so make sure you pop in and see all the team and leave comments to be in with a chance of winning their digistamps - we're keeping it secret who has the key to the digis so you have to enter on everyone in case you miss out LOL!! you all made such fabulous creations it was really difficult. Congratulations to everyone, don't forget to take your blinkies from the sidebar. Welcome back to another fabulous challenge! 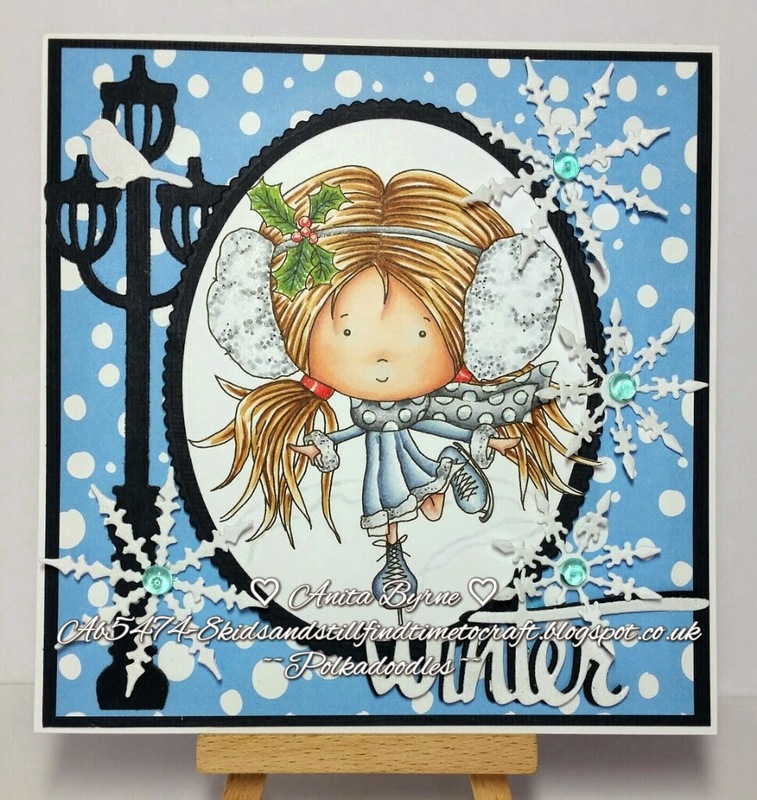 We've gone all "Secret Santa" here at Polka Doodles for the next fortnights challenge as we wanted to make our last challenge of 2014 a little bit different with the festive season looming. 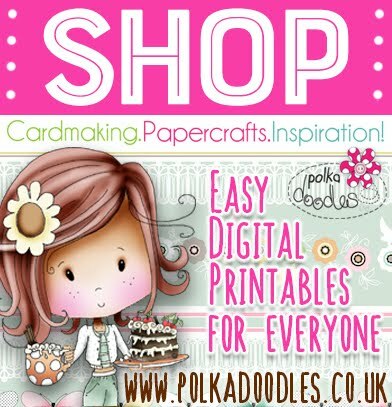 NOW as an added bit of fun, visit each DT blog and have a guess, using the clues, as to whom they may have made their project for .... leave a comment on their blog with your idea and you could be in with the chance of winning a prize of a wonderful Polka Doodles digi image. 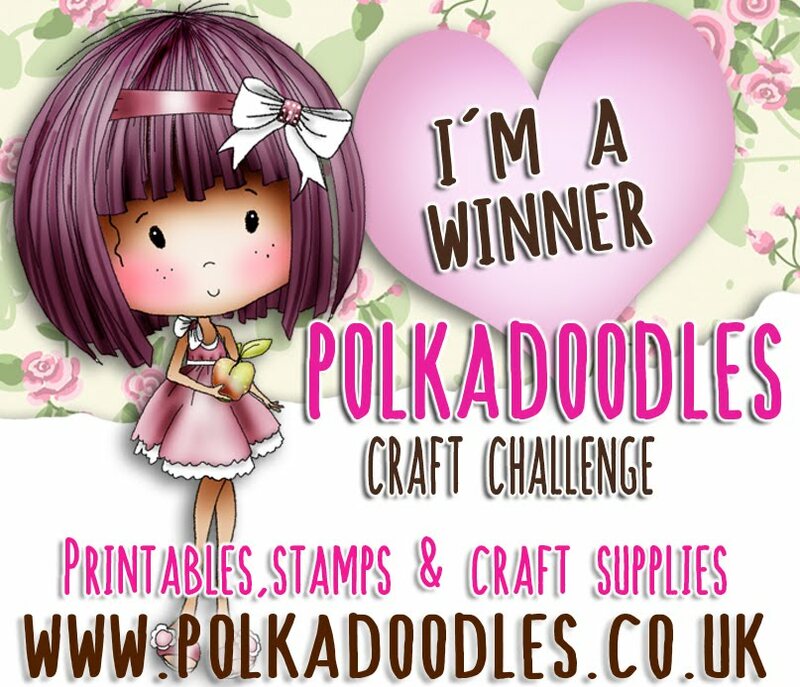 We will randomly choose 3 DT blogs (names in a hat thing) and then randomly chose a comment from each blog and the winning comment will each receive a Polka Doodles digi image. The winners of our Clean and Simple Challenge Weeks 46/47 are at the end of this post! Scatty Jan Wow how much fun are we going to have over the coming weeks - I made my card using the Festive Hollybobs collection - This is available as a cd or download collection. Asha - Secrets, surprise and Santa ... these are a few of my favourite things! The background paper is from Angelberry Christmas, the cosy houses and trees are from A Home For Christmas and the greeting is from Festive Hollybobs. To accentuate the snow I used Texture Paste and glitter. For extra sparkle and shimmer I used Liquid Pearls and Stickles. Clue: My Secret Santa is into crafting, cooking and cats. She lives way across the pond and ... tell you more on my blog! 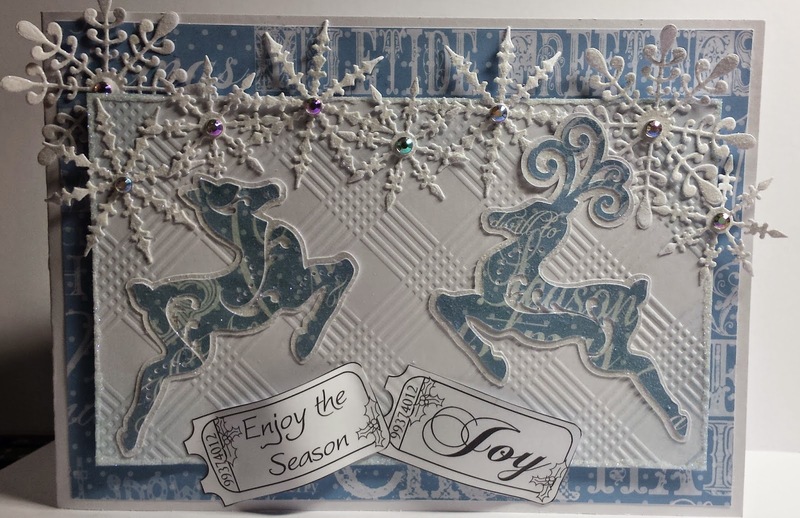 Karon - This is so much fun and great that you can all join in too :-) I have also used the fabulous Work and Play 5 Festive Hollybobs collection for my card. I coloured this little lady with pencils. She is also available as a single download, along with other characters off this wonderful CD. Ashley-What a blast this week has been making my Secret Santa Card for a Secret Friend! I used the amazing Festive Hollybobs collection. (Yes I am addicted to that one) Since this is a Christmas Challenge I just had to do a whimsical Winter scene. 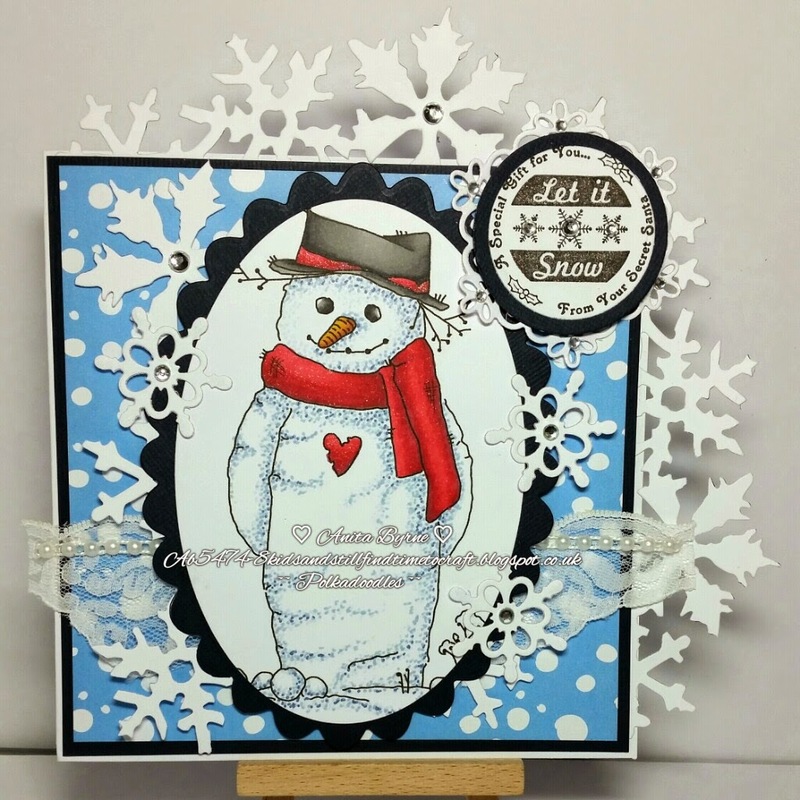 I tried a fun zig zag snowflake print for the background and I think it makes the card all the more "whimsy"
My very first clue for the recipient of this card is that she has beautiful blue eyes. Need another hint? Hop on over to my blog and catch the rest of the clues! 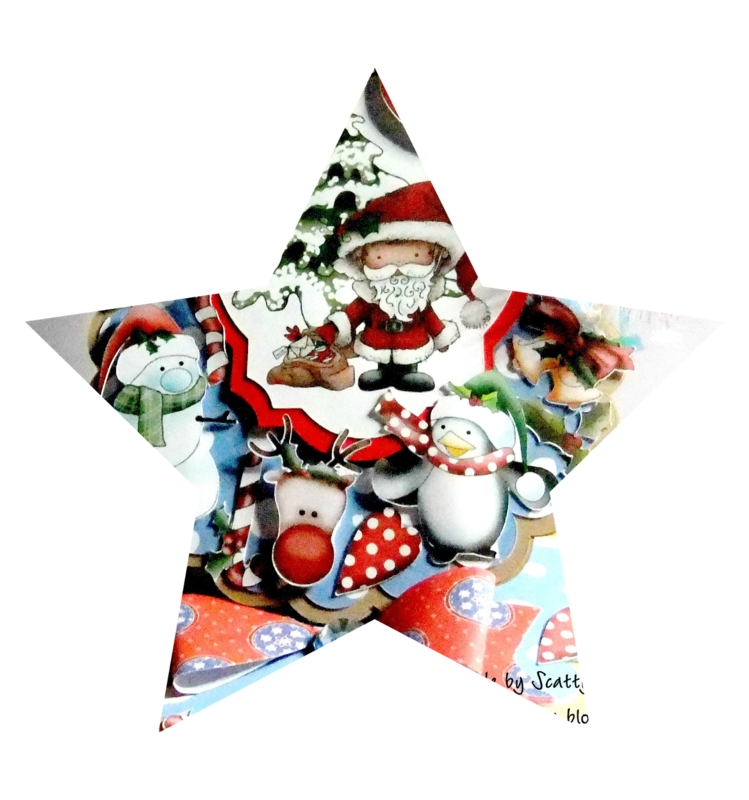 Mel - I had great fun making my Secret Santa card - the CD I opted for is once again Festive Hollybobs, and I've gone a bit dotty for beautiful big satin bows since using this gorgeous ribbon on a gift bag recently. I love the sumptuous effect it gives for this time of year! And of course you can't go wrong with a lovely stick pin and some sparkly silver skeleton leaves. Anna - As a surprise for a very nice friend living in England, and who creates beautiful things (you can read more about her on my blog), I decided to make a round, Holiday card using paper from the Picknix Collection 2...Gingerbread Twist CD collection, without a picture, but with my favourite die cut deer, a poinsettia, which I made myself, and a Polish saying “Magia Swiat Bozego Narodzenia”, which means “The Magic of Christmas”. 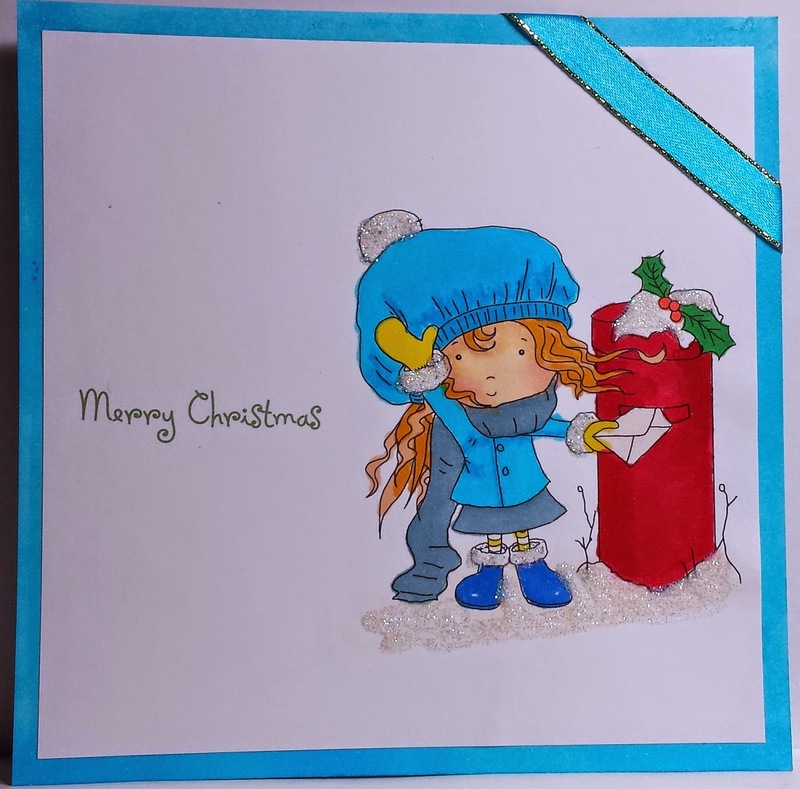 Besides blue, which I used here, all accessories are in two colours – white and red (they are symbolic of Poland, a country in which I live) - because I wanted the friend, for whom I made this card with great pleasure, to know where I am from. Leah - Hello everyone! It's a might chilly up here right now, so the heat is on full blast! I have made a Christmas card for my Secret Santa recipient using Maddie with Present, and some of the cut out printable tags from the Festive Hollybobs Collection. I coloured Maddie with my Prismacolor pencils and used a Wink of Stella pen to give her an all around halo. 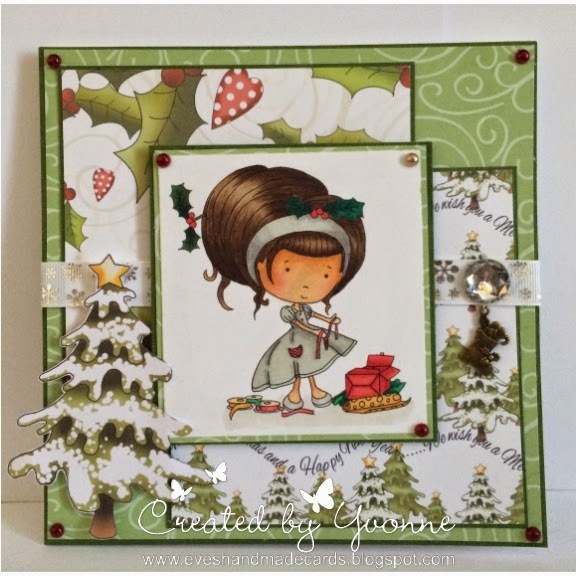 Cheremane - I love this fab idea and I hope you will enjoy and join in the fun with us. 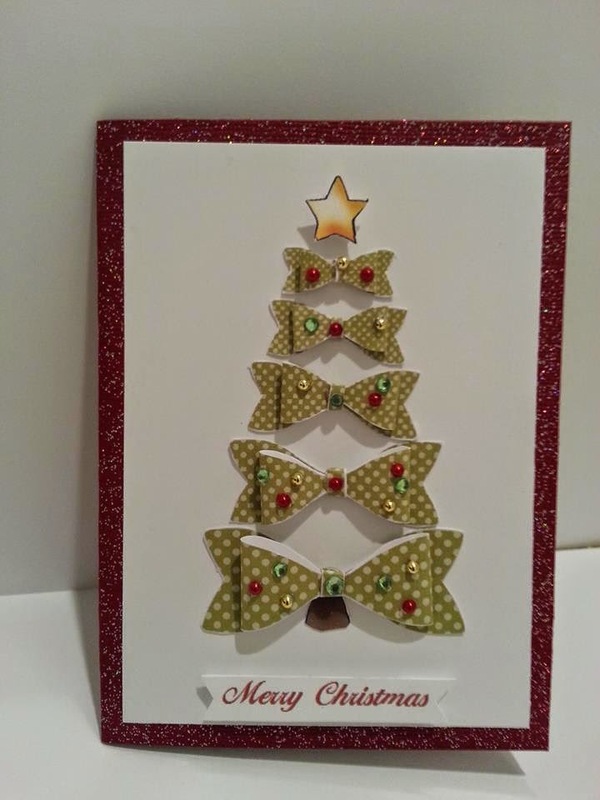 I have done a clean and simple Christmas card for my Secret Santa and I have used Octavia Friendly Hugs Digi and the Papers and Bow are from Work and Play Festive HollyBobs Cd. Now onto a clue: She is a lovely lady and loves Fairy's, for a few more clue's pop on over to my Blog. Lou: I hope my Secret Santa person likes my card as I have been brave and used glitter just for them. 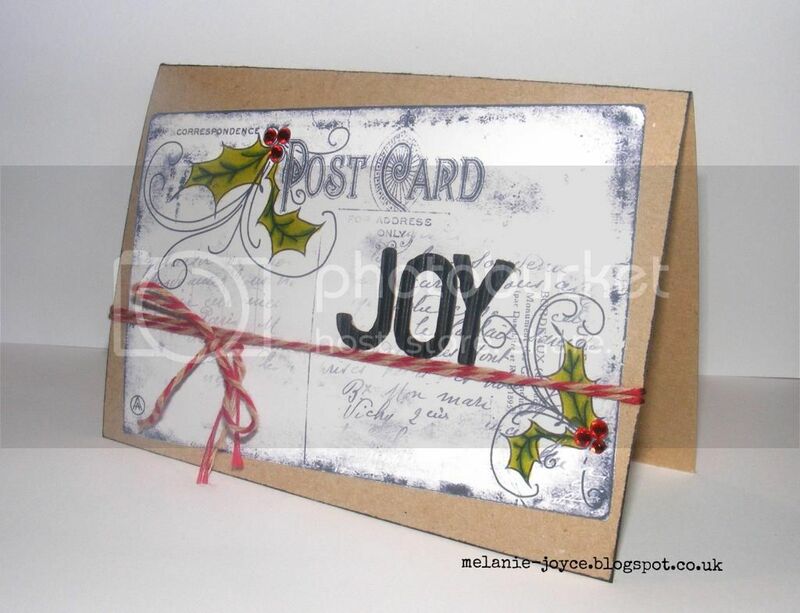 I have used an image from the Work and Play Festive HollyBobs CD and papers from Angelberry Christmas. My first clue is that this person lives by the coast. Just to let you know that the winner for our Nordic Christmas Challenge, will be announced next Friday, 12 December. See you next week for Round 2!! Good luck!! It's Friday! 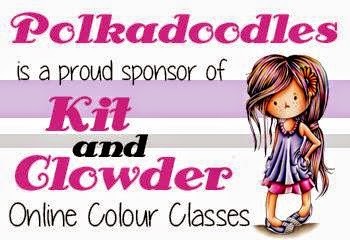 And it's the start of another fabulous challenge here at Polkadoodles. encompassing lots of rustic tones, reds and greens and snow snow snow, all those lovely Nordic style patterns but really it's open to interpretation of what YOU think Nordic means! You will have until Friday 4th December, noon GMT, to enter. The winner of this challenge will be chosen at random and will receive a £5 voucher to spend in the digistore! Yvonne - Now to be honest, I wasn't a hundred percent sure what Nordic Christmas was but, using Work & Play; Festive Hollibobs which is available as a Digi Download Collection or as a CD-Rom. 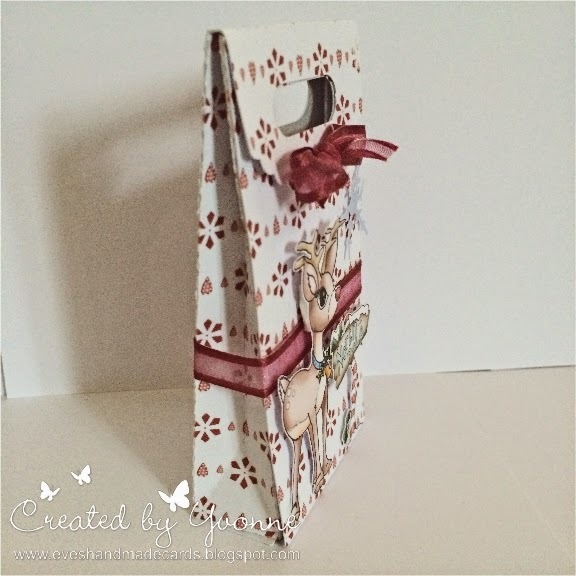 I opted to make a little treat bag using one of the fab papers from the collection. printed and cut out the Reindeer & North Pole embellishments to decorate the treat bag with. A little bit of ribbon coloured to match the box using my Graph'It Markers to complete the bag. Anjie - I got these MDF letters at a craft show back in the summer and dug them out for this challenge. I love nothing better than to make my own Christmas decorations, I think it shows your own style off to people. I started by giving them a coat of White Gesso. The papers I have used are from Magical Winter and all the embellies are from Work & Play Festive Hollybobs. 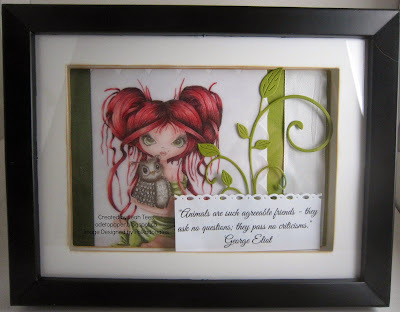 I have done faux stitching with the white Shake It pen from Graph'It Markers and I have added some White Gesso and Light Modelling Paste to look like snow. 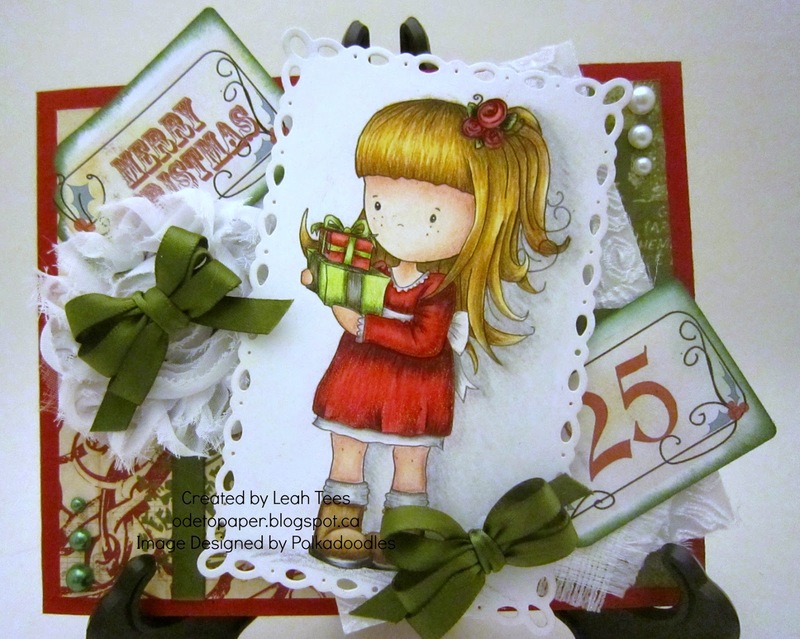 The die cut poinsettias are from Tattered Lace. More photos can be found on my blog. Jenny - I've used the backing paper from Work and Play Festive Hollybobs to make my card as I thought it was perfect for our challenge. Full details are on my blog. 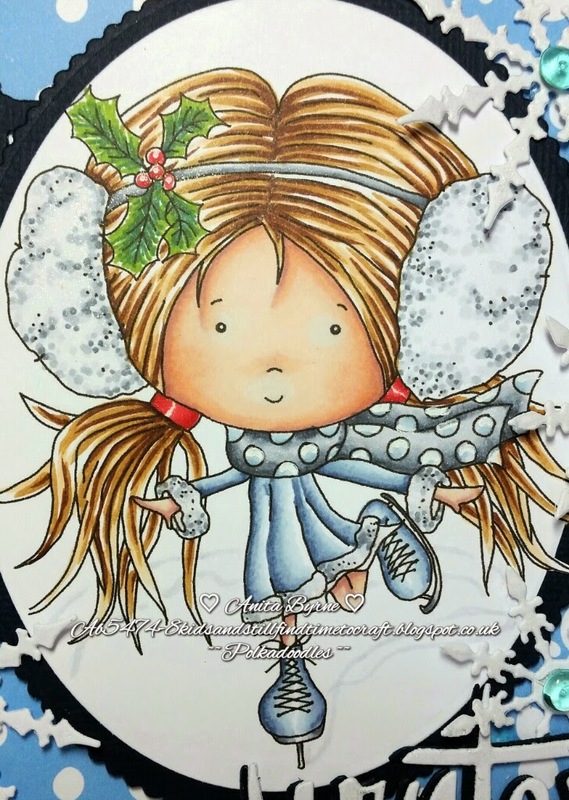 Anita- oooooo I had a play with work and play 5 festive hollybobs collection Isn't this skater girl a cutie pie .. she available on a CD-Rom I coloured with alcohol markers and added a bit of sparkle so for more info why not pop by. Isn't he cute? He's a digi from the Magical Winter 1 collection and I adore him I coloured him in as usual with my good old Graph'its. 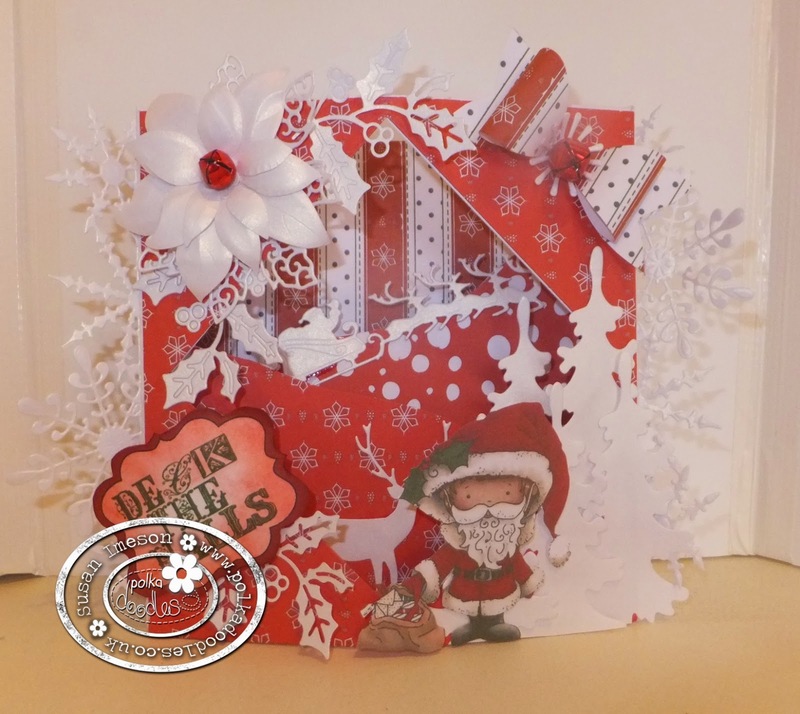 The backing paper, sentiment and snowflakes (glittered) are all from the brilliant Work & Play Hollybobs CD. Wow - Amazing inspiration from the Design team this week!! Have a fabulous week everyone - we'll be back next week with winners and a brand new challenge for you! for a limited time - definitely worth watching for some inspiration! You have until noon GMT Friday, November 28th to enter. The winner of the Week 44/45 - Recycle It is at the bottom of this post. 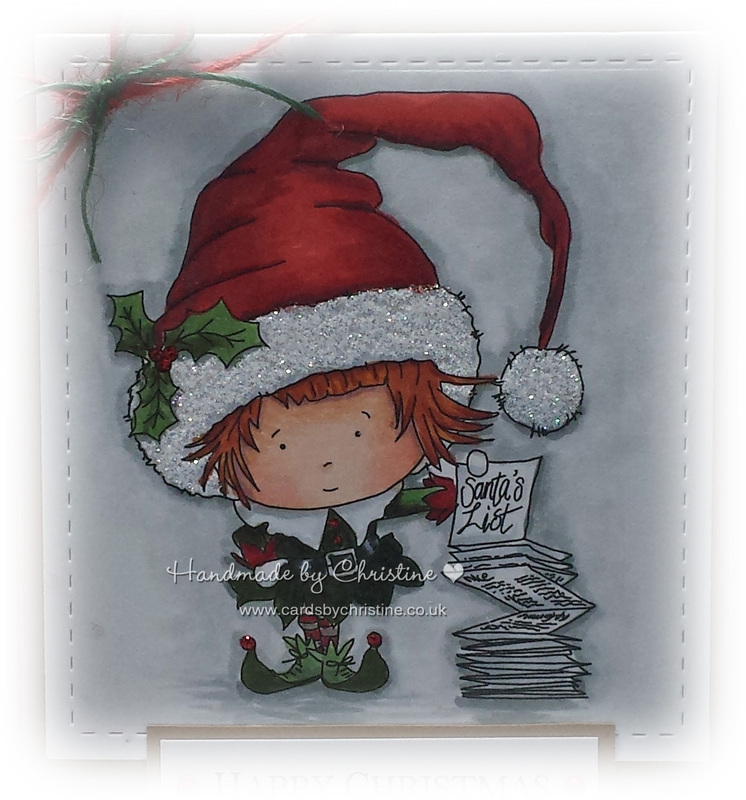 Bev here with my CAS creation, I used the Hollybobs Santa Digistamp, scaled it to the required size in my graphics program me and added my text in the opposite corner printed off then coloured with my Graph'it Markers. I just adore this little fella. 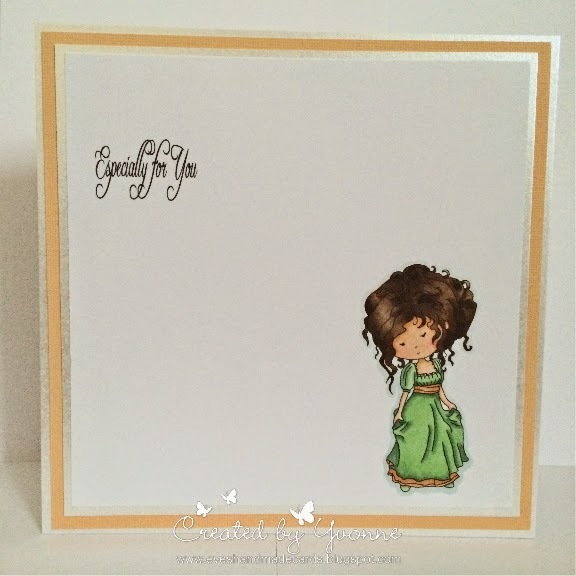 Yvonne - For this challenge I used 'Miss Millicent' from the gorgeous 'Rose Budd' Collection, which you can get as a digi download collection or as a CD-Rom. You can also get her as a clear stamp. I coloured her with my Graph'It Markers - pop over to my blog for details. Anita - Hi there this has to be one of the hardest cards to do CAS wow the urge too embellish was unreal lol. Today I have used Winston Bear Heart of Gold, which you can get as a digi download collection or as a CD-Rom. 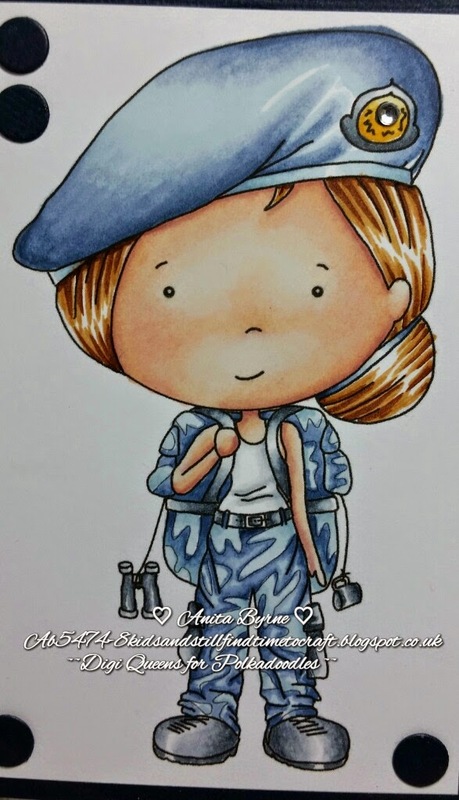 I coloured her using Alcohol Markers - For more info visit my blog. 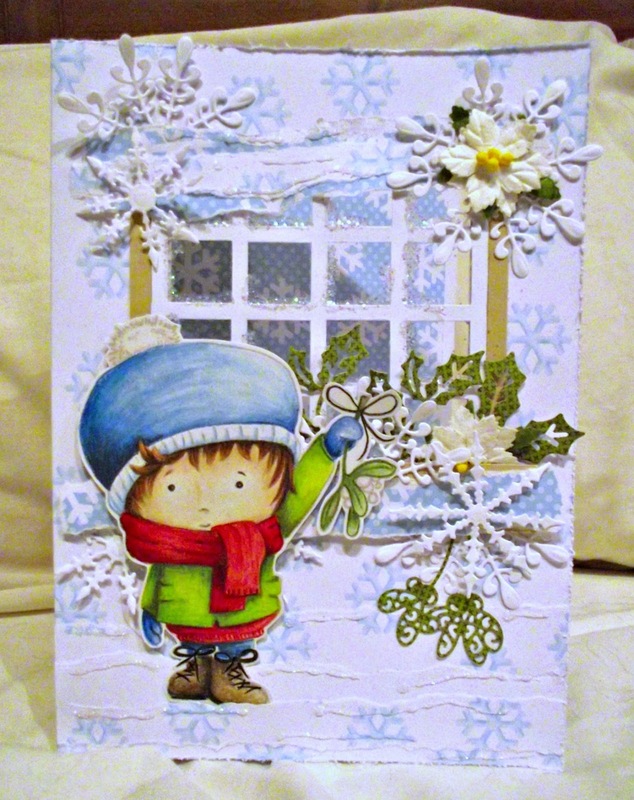 Jenny - Here is my card for the CAS challenge, I have used Festive Holybobs which you can find here. It's a great cd and download and it's one I'll be using for a few years to come. Pop over to my blog and see more details. Susan - Well for those of you that know me I don't do CAS ,so for the first time ever this is my take on CAS. 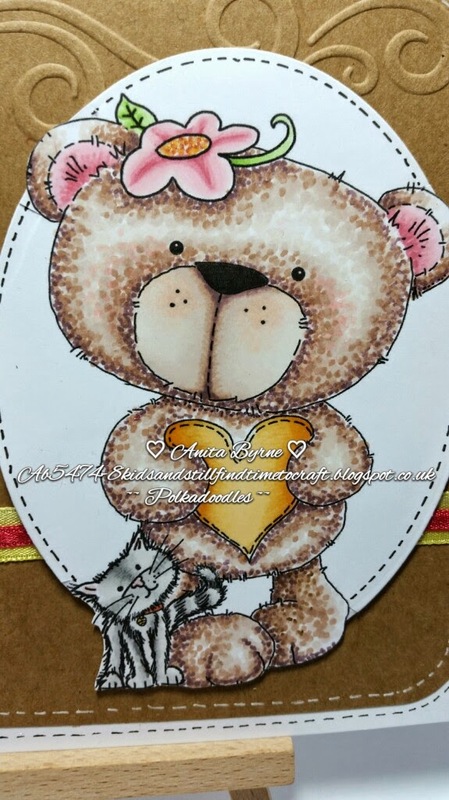 I have used the beautiful Octavia Friendly Hugs Digi printed on water colour paper and coloured with my New Derwent Inktense Pencils .This is my first attempt at using them and boy do I love them . Frezja - what a challange! For me almost no work to do because I like a lot of details..
You will have until Friday 28th November, noon GMT, to enter. 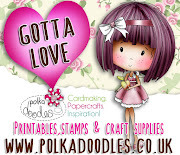 which is next week with another fabulous Polkadoodles show - don't miss it because there's something special going on! Asha - Not being CAS-worthy I struggled to make this card. 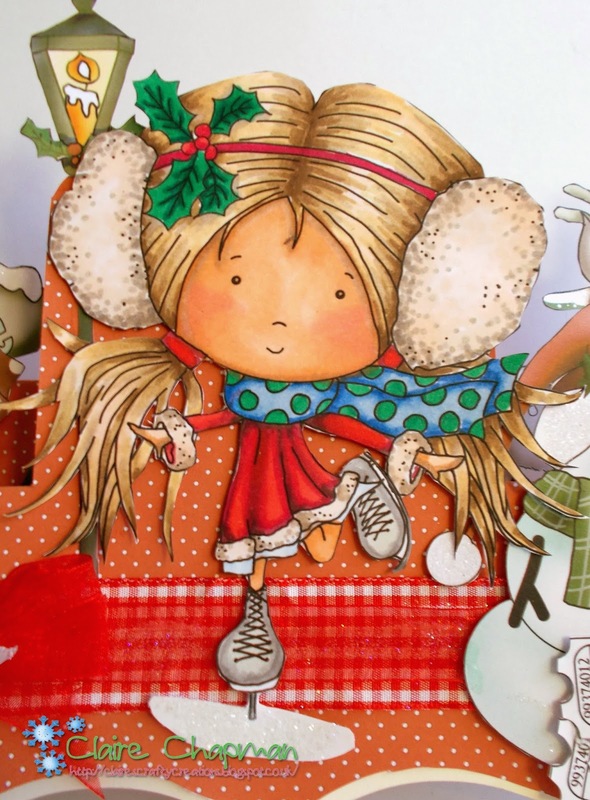 For my project, I used Libby the gypsy girl from the Fredericka Mini CD collection and dressed her up in Christmassy colours with the help of Graph'It markers. 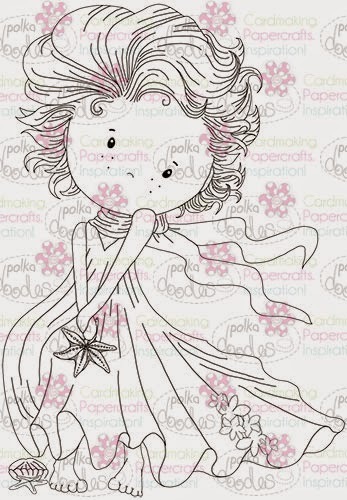 You can also download Libby as a single digistamp. The sentiment is from Gingerbread Twist. Somehow it seemed appropriate, given my fertile imagination! A little gold choc wrapper, gold stitching, 3 eyelets, a few Liquid Pearl droplets and it's done. 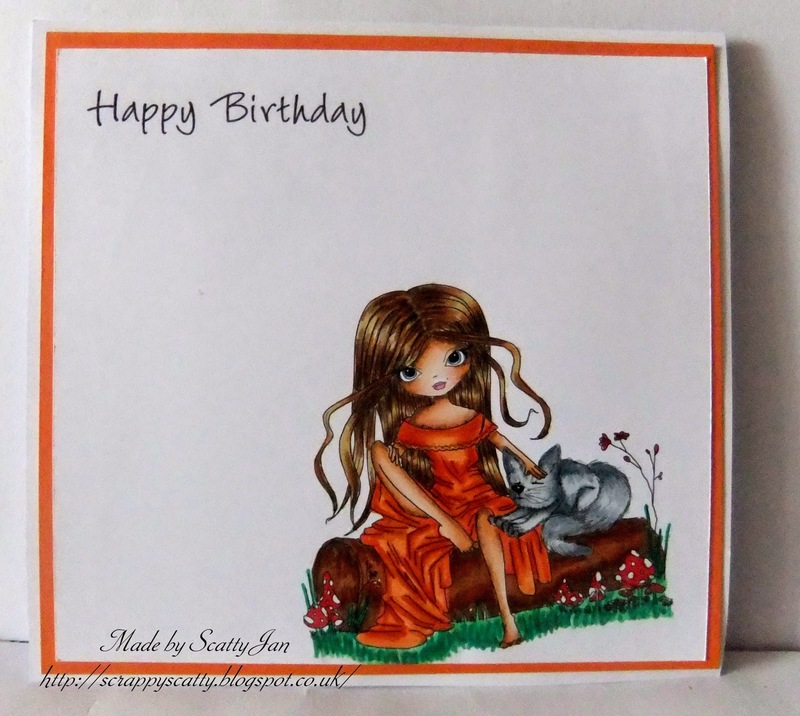 Anna - I don't often make cards in the Clean and Simple style, but here it is - a very simple and uncomplicated card. 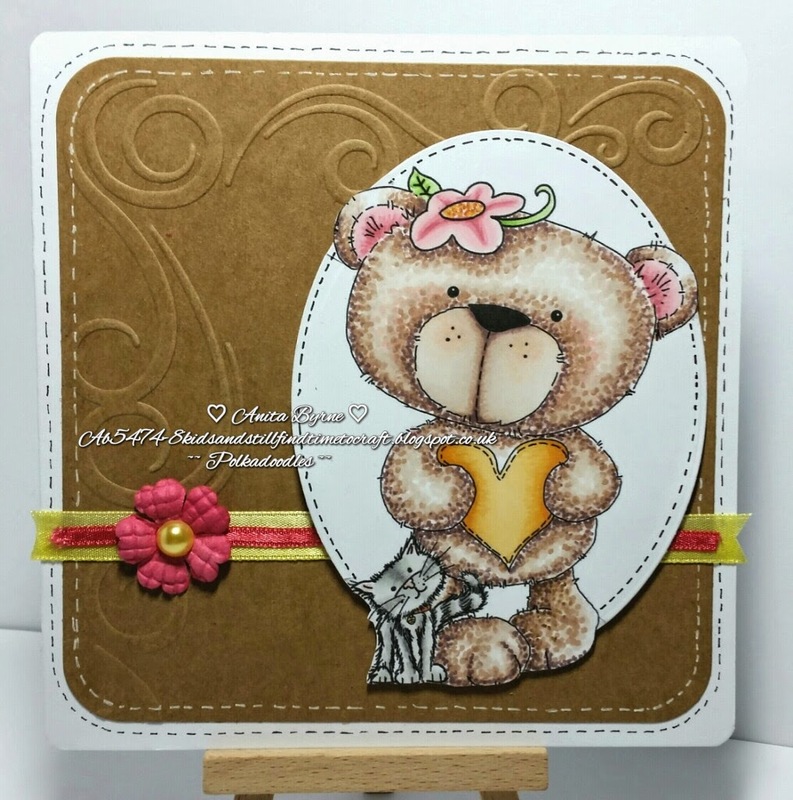 The background is made from a corrugated cardboard and on it, just a beautiful image of a Teddy Bear from the Winston Deluxe Papercrafting CD collection, and a tiny clothes pin on the bow. Karon - Well, CAS hmmmm! This is probably as close as I will ever come to a CAS card. The temptation to add bling to those snowflakes was really hard to resist. As is, I had to add ribbon and the embossed background ;-) I used the pre-coloured snowman off the fabulous Work & Play 5 - Festive Hollybobs collection, and decoupage him. The sentiment is from A Home for Christmas CD collection. Cheremane - It's really hard for me to do CAS as I just love using ribbon and bling, But I have to say I really did enjoy making this card and maybe its a start of more cas from me. 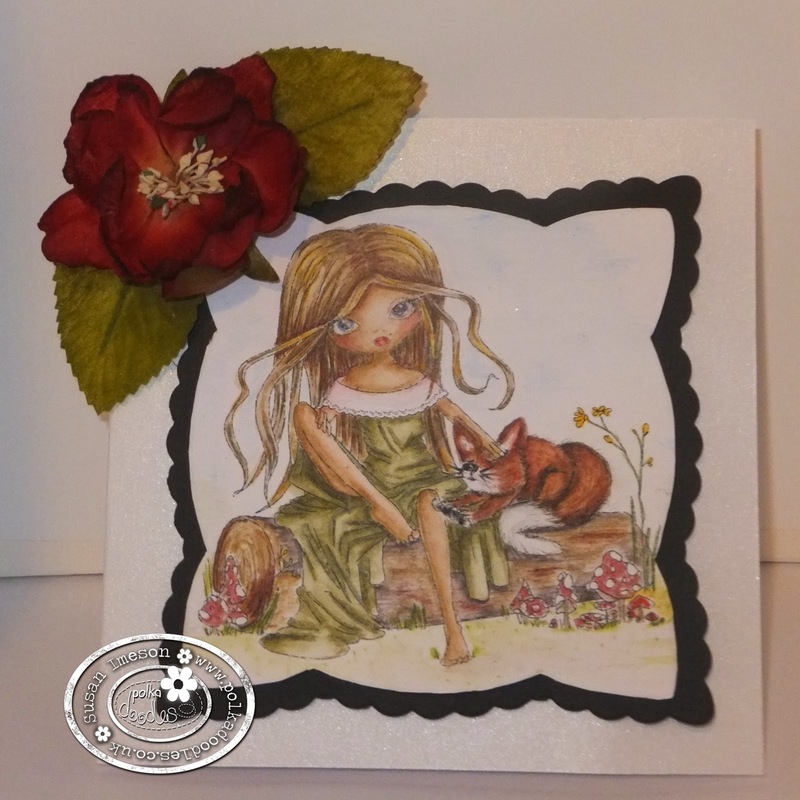 I have used the gorgeous Octavia Thinking Digistamp and delicately coloured her added a little glamour dust along with some simple mat and laying and just one gem as I just couldn't resist. Ashley - I have a very hard time with open white space I feel like its so limiting but it is also amazing! Okay well let me stop rambling, look at this beauty, I am so proud that I was able to do CAS. 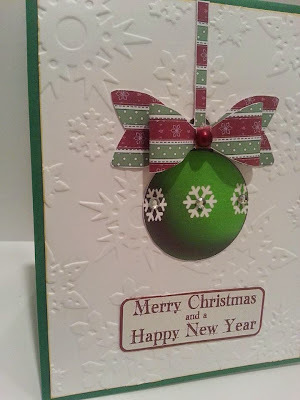 I used the Work & Play 5 Festive Hollybobs collection. I can not stress this enough, if you do not have this set you NEED it! IT has the absolute best digi images of the season! 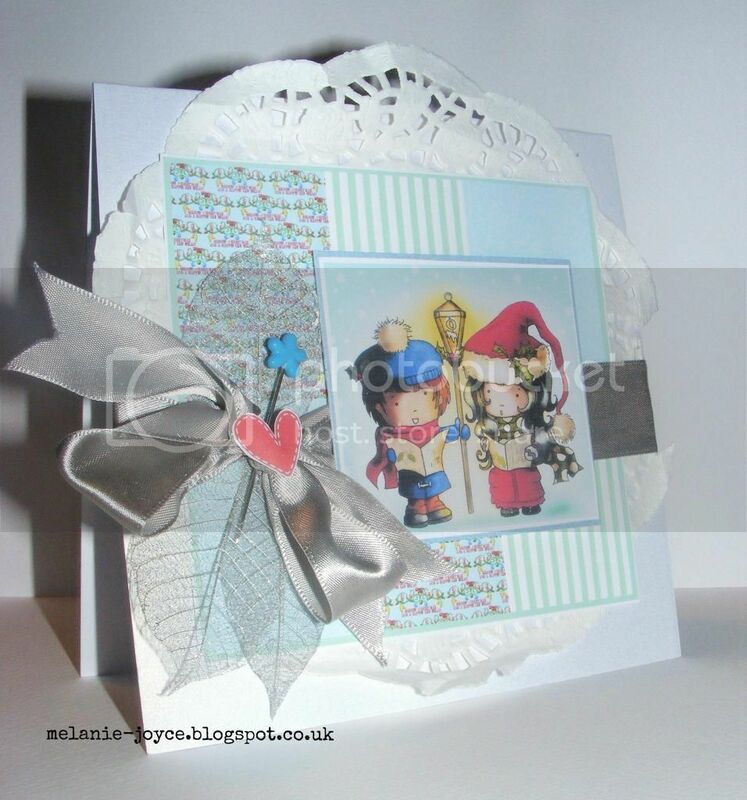 Melanie - I love clean and simple cards - I would definitely say it's my style! 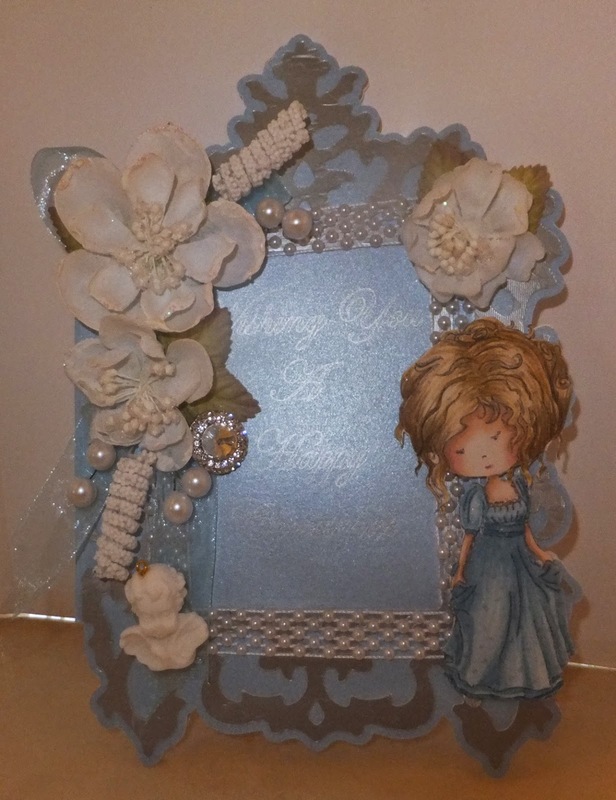 Don't feel you need to use a white card blank to get this look - the emphasis is on placement and embellishments (or lack of them! ), making sure your finished product is unfussy and uncluttered. 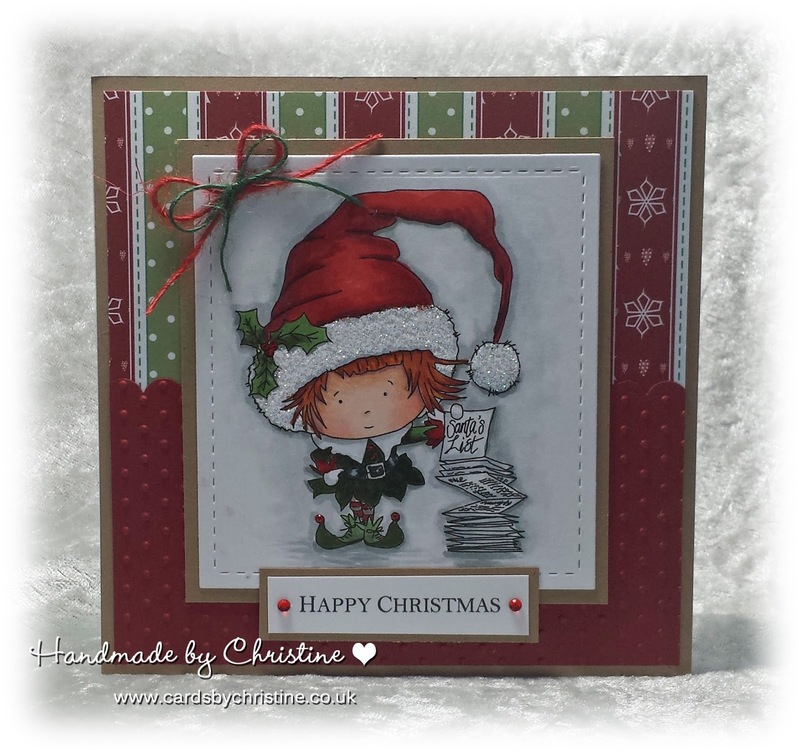 For this card I used the lovely black & white postcard from the Festive Hollybobs CD. I mounted it onto a kraft card blank at an angle, coloured the holly leaves with my pens and added a subtle pop of red with some gems for berries. I then simply tied the card with red & brown twine and added my sentiment. So simple! Wow - Amazing inspiration from the Design team this week. Welcome back to some more inspiration from the Digi Queens. You can get Shannon HERE... I also used the Rose Budd papers from the Rose Budd Collection CD. I have coloured up Shannon with Copics, as follows. Hi there Anita here. 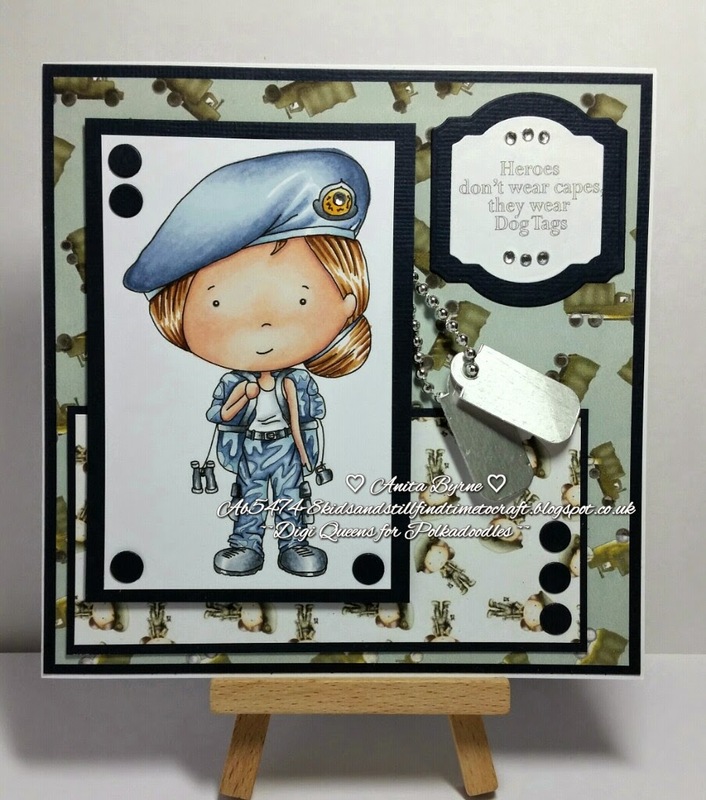 This week I decided to use a little cutie called Army Girl what an awesome image so versatile for young and old . 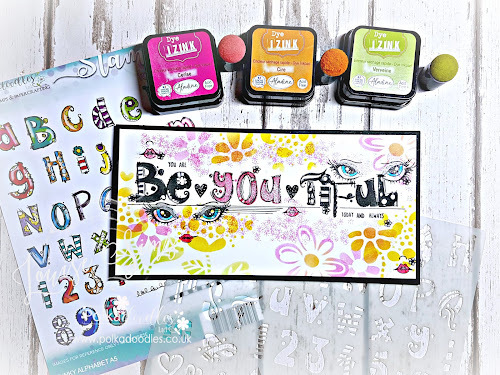 I also used these co-ordinating backing papers from work & play collection 2 .. you so have to check these out. Hair : Burnt sienna, raw sienna, Oatmeal. Skin: Almond, Blush, Oatmeal, Soft peach, Dusky rose, Pastel Pink. Blues: Midnight Blue, Cornflower Blue, Denim Blue, Pastel Blue. Greys: Cool Grey 5, Cool Grey 3, Cool Grey 1. Yellows: Amber, Gold, Pastel Yellow. Hi.. Christine here! 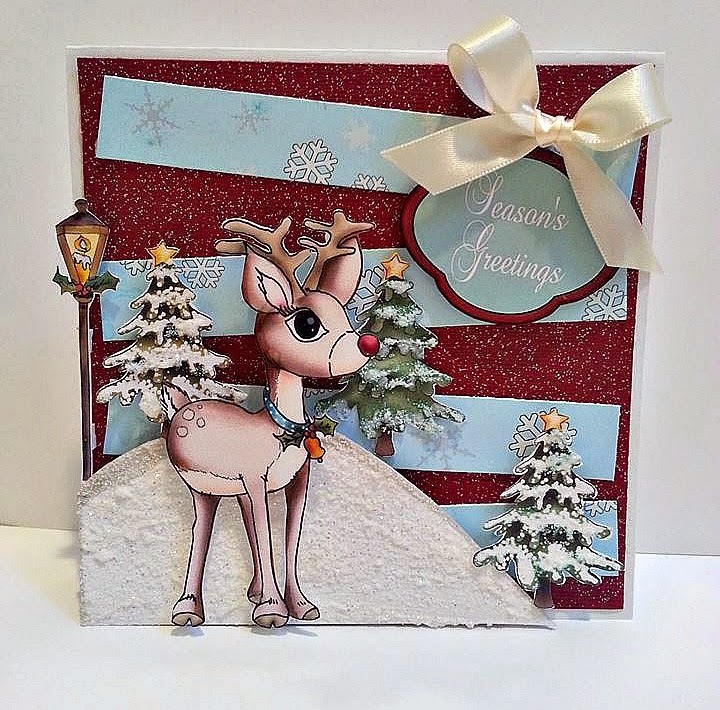 OK, I'm feeling all Christmassy already - so I chose to use a fabulous Hollybobs image and paper too from the Work and Play 5 Festive Hollybobs Collection﻿. 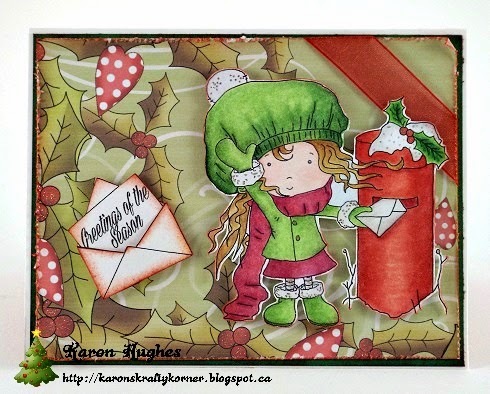 I so love using the traditional Christmas colours when I get chance and this little Elf cried out for those! Thanks for joining us again today - don't forget to pop over to the Digi Choosday team to see what they're doing this week - and you might find a little surprise over there too! We'll back on Friday as usual with another challenge so see you there! !